Econcore honeycomb cores for lightweight panel. The show is quite large - more than 1,600 companies exhibiting in 10 halls, 90,000 attending - so it is not possible to even see everything here. 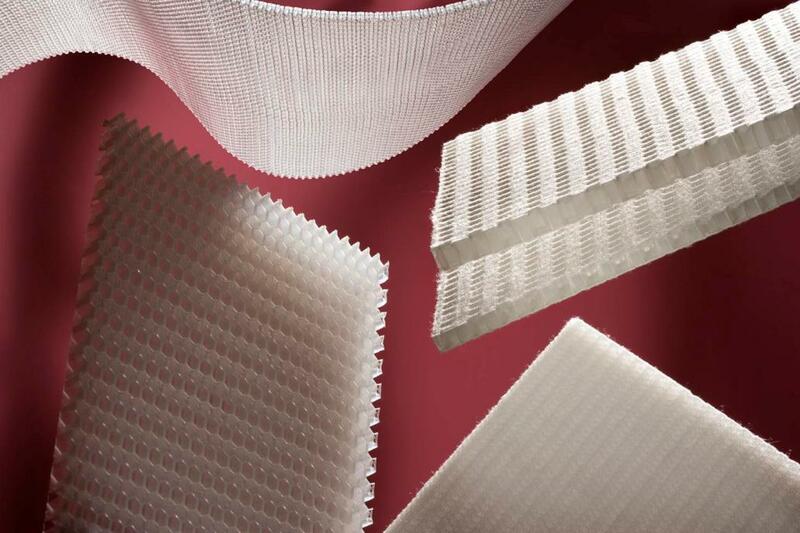 But two areas that stand out right away are the continued interest in the manufacture of lightweight panel, and new developments in edgebanding. Both have obvious implications for adhesives. An all day conference focused on market adoption of lightweight panel, particularly in Germany where advocates tout its advantages in shipping and reduced materials requirement. The presentations then moved into mechanical properties of the lightweight panel sandwich - honeycomb and other core designs - and how these panels measure up in production versus MDF or other board products, as well as their strength in end use. The addition of plastics to some forms of lightweight panel core is being enabled by technologies from BASF and EconCore. On the edgebanding side, we have now seen two machines at Ligna 2013 using hot air to apply edgeband, but in a new way: they are working with co-extruded edgeband that has the adhesive built in- designed originally for laser edgebanders. These can provide the tight seam or no- gap edge in some applications, but the machines cost less than the laser variety. This blog was also posted at Franklin Connections Blog.